Distillation is the process of separating two or more liquids based on differences in their boiling points. When the liquids’ boiling points are very similar, however, separation by normal distillation becomes ineffective or impossible. Fractional distillation is a modified distillation process that allows the separation of liquids with similar boiling points. A liquid’s boiling point is the temperature at which it transforms to vapor. Liquids retain their characteristic boiling point even when mixed with other liquids. This represents the underlying principle of distillation---that liquids can be separated by converting the liquid with the lowest boiling point to vapor, then converting that vapor back to the liquid state after it has transferred to a separate container. In the process of distillation, the liquid mixture is placed in a boiling flask, which is connected to a cooling column called a condenser, the opposite end of which is connected to a receiving flask. The condenser sits horizontal with a slight downward slope so that the vapor that reaches the condenser and is converted back to liquid can be collected in the receiving flask. The chemistry department at Wake Forest College provides a diagram of the setup. At completion of the distillation, the lowest boiling liquid ends up in the receiving flask (and is called the “distillate”) and the higher boiling liquid remains in the boiling flask. 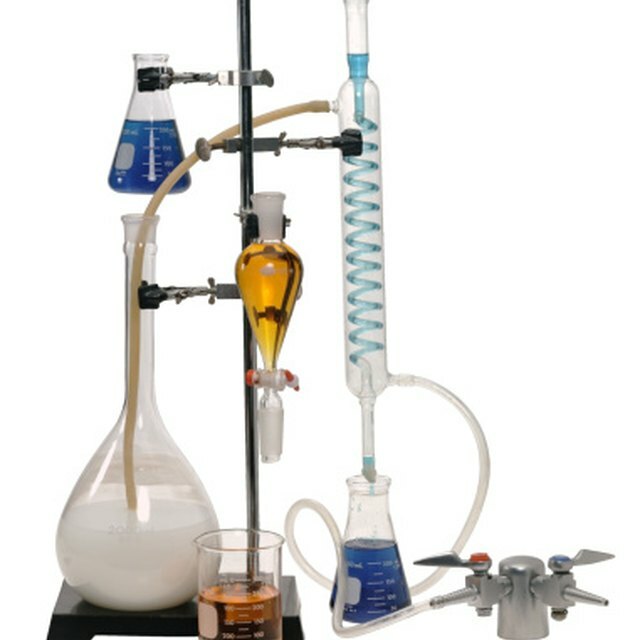 A fractional distillation setup includes an additional column that sits vertically on top of the boiling flask and to which the condenser is connected. Its purpose is to increase the distance that the vapor must travel to reach the condenser. The columns are typically packed with glass beads or pieces of ceramic to increases the surface area the vapor must come into contact with as it transports to the condenser. During normal distillation, a substantial amount of the higher-boiling liquid also will vaporize and transport to the collection flask, essentially becoming an impurity in the distilled product. This is especially problematic when the liquids being separated have similar boiling points. The more surface area the higher-boiling liquid contacts along the way, the more likely it is to condense back to a liquid and return to the boiling flask. Fractional distillation uses this increased surface area to improve the efficiency of the distillation. The two primary applications of fractional distillation are the refining of crude oil and the manufacturing of spirits (alcoholic beverages). Crude oil contains numerous different chemicals, many of which have similar boiling points. Refineries separate these chemicals by boiling point into various products. The lower-boiling fractions become petroleum gas or gasoline, the intermediate-boiling fractions become fuel oil, diesel fuel, or kerosene, and the highest-boiling fractions become paraffin wax or asphalt. The fermentation of sugars into alcohol stops when the alcohol content approaches 13 percent because the yeast cannot survive at higher alcohol concentrations. The boiling points of alcohol (78.5 degrees Celsius) and water (100 degrees Celsius) are similar enough that distilleries must use fractional distillation to concentrate the alcohol to about 50 percent (which is then called “spirits”). The distillation process at an oil refinery consumes 2 barrels of oil in energy for every 100 barrels of refined oil. What Is the Purpose of Simple Distillation? Brubaker, Jack. "How Does Fractional Distillation Work?" Sciencing, https://sciencing.com/fractional-distillation-work-6310159.html. 13 March 2018.